Editor’s note: I owned a flip phone for this period of the build and many original photos have since been lost. As a result, photo quality is hit or miss depending on if I could con my brother into taking photos for me or not. If you missed it, you can read Part 1 here. By mid December of 2008 I had graduated from college and moved back home to Ann Arbor on the Southeast side of Michigan to begin my career as a graphic designer. I elected to live at home with my mother from that time until Alicia and I’s wedding in July to save some cash and make life easier in general. Now that I was working in the real world, I had a bit more disposable income to use on my project car in addition to all of the aftermarket items from the Solara that I sold. I admittedly didn’t know a lot about what was considered cool in the S chassis world. Up to this point I had only been a part of the Camry community (yes, there is such a thing) and had learned to approach building cars in a very systematic way. 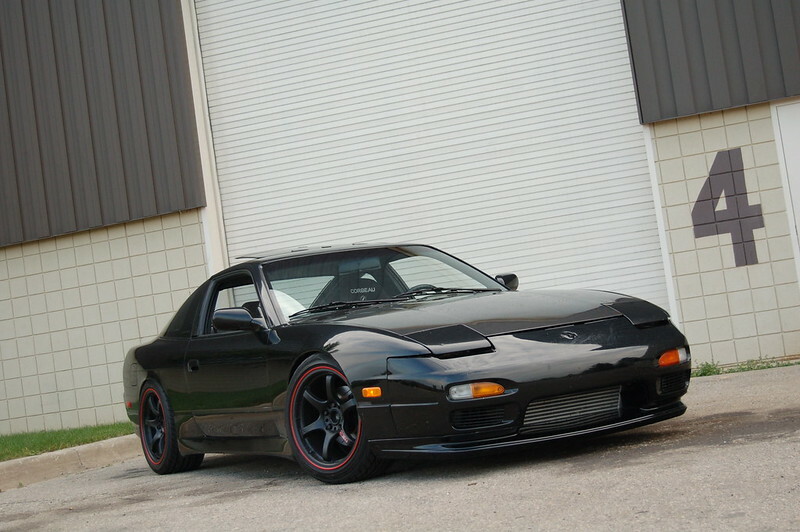 The kids that were modifying Camrys and Solaras typically didn’t have a lot of money and aftermarket support was at a minimum. 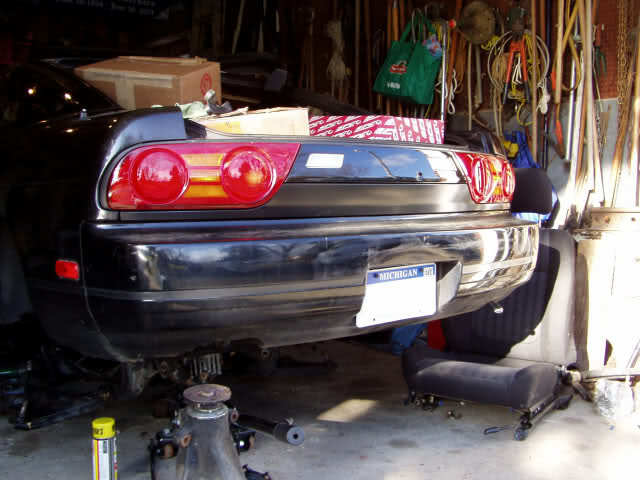 The platform generally wasn’t respected, so as a result people had to be very careful about what they did to their cars to avoid being labeled as ricers. Vinyl stickers, neon lights, “mellon-shooter” exhausts, and the like were all frowned upon by the community. Everything had to be subtle and executed in a clean matter, from exterior modifications to exhaust and wheel choices. No one would be caught dead with fiberglass aero. It was these philosophies within to Toyota community I found myself in that resulted in my 94 Camry and 99 Solara both being regarded as some of the best examples of that particular chassis. Granted, there weren’t many kids modifying these cars at the time and most of them didn’t have the means to do so, but it still felt good to be known within the community and feel like I had accomplished something that helped others. 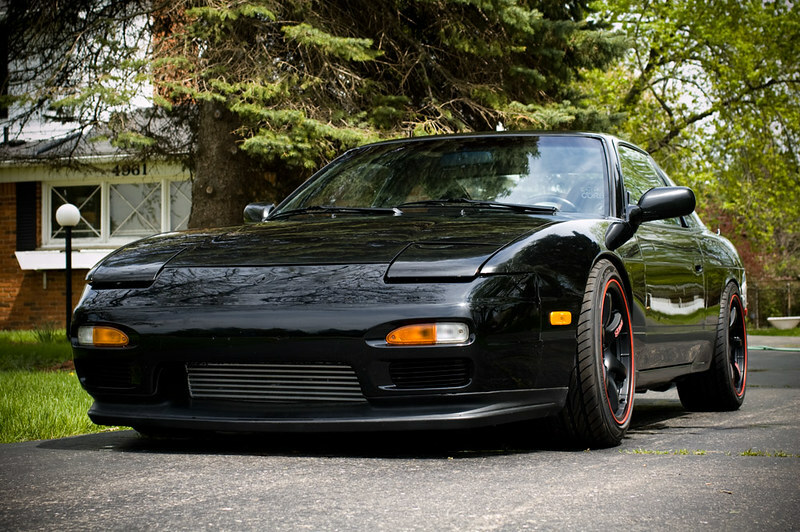 When I dove into the vast S chassis community, I knew that I would never build anything that would be recognized within that culture as everything had already been done before and there were already so many incredible examples of the S13 out there. Surely I would never be able to build something on that level again, but at least I would have a fun car to drive and the support of the aftermarket. I set out to improve and clean up a few aspects of my S13 during the winter months. But as these things typically do, the build snowballed into a little more than I had initially expected to get into. 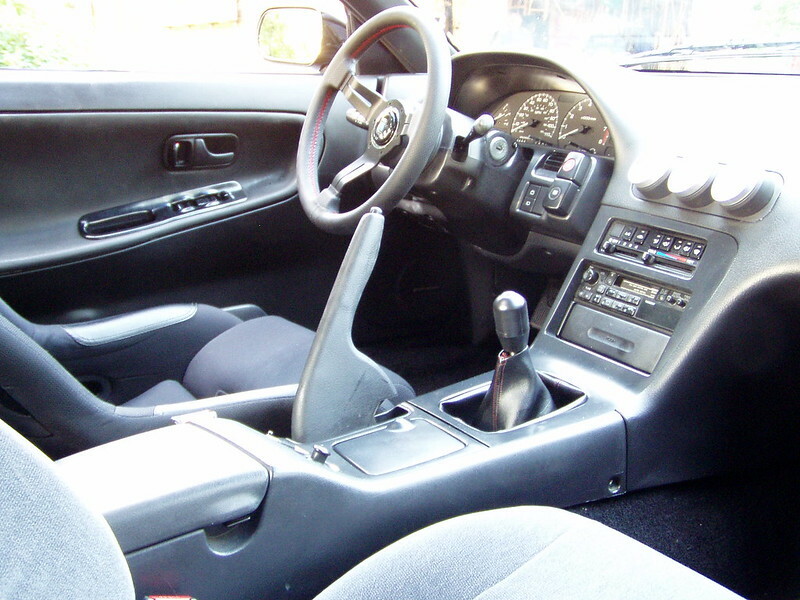 I began with the interior as I felt it was one of the more nasty areas of the car. 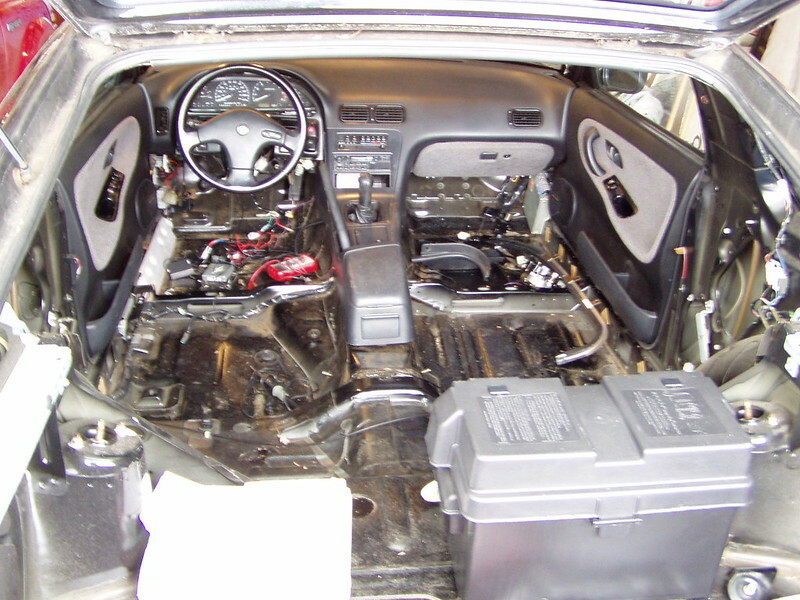 I stripped the interior completely and removed all of the sound deadening. Why, you ask? I am honestly not sure, but it seemed like the cool thing to do at the time. I purchased new carpeting from StockInteriors.com to replace the stained and torn up factory carpet. The nasty old seats were replaced with a Corbeau bucket for the driver and an S14 seat for the passenger side. I installed a trio of Defi gauges in the dash that I had kept from my Solara, along with a Nardi deep corn 330mm steering wheel. A B&M shifter with NISMO GT knob replaced the sloppy factory shifter. A number of OEM panels and trim were replaced including the shift boot and wiper/turn signal stalks. Finally, the cheesy automatic seatbelts were tossed in favor of a Japanese manual seatbelt swap. While slowly making progress on the interior, I began to mess with the car’s suspension. I wanted to lower the car properly and found that the old Tein coilovers on the car were siezed up. 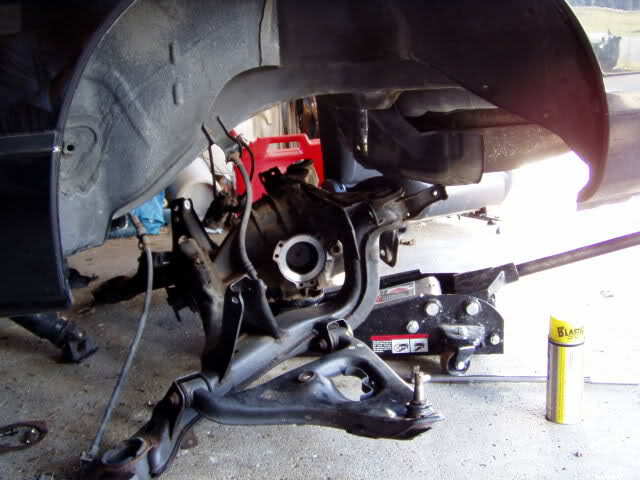 I replaced them with a set of K-Sports and purchased SPC control, toe, and traction arms for the rear of the car. To run some nicer wheels, I needed to convert the car to five lug from the factory four lug setup. I purchased a set of Ichiba hubs with Q45 front brake calipers for the front and kept the stock brakes on the rear. The brakes were freshened up with stainless braided brake lines, Rotora slotted rotors, and Hawk street pads on all four corners. I wanted to remove all of the slop in the aging stock suspension, so I elected to install Energy suspension bushings in the rear uprights and control arms along with new ball joints. While all of this was apart, I decided I might as well install the VLSD that was included as a bonus spare part when I bought the car. This snowballed into dropping the subframe and installing SPL solid subframe bushings and giving everything a coat of paint to freshen it up. By spring time I had successfully completed all of the suspension and brake modifications as well as the interior makeover. Nearly everything had been replaced aside from the majority of the front suspension (tie rods, control arm bushings, tension rods etc.) that I had elected to leave that alone for the time being. I made some new friends over the winter that helped me identify the issues with the car and get it running again. For some reason the ignitor and 70A main fuse had blown and the ECU was fried as well. Aside from fixing those items I largely left the engine alone. 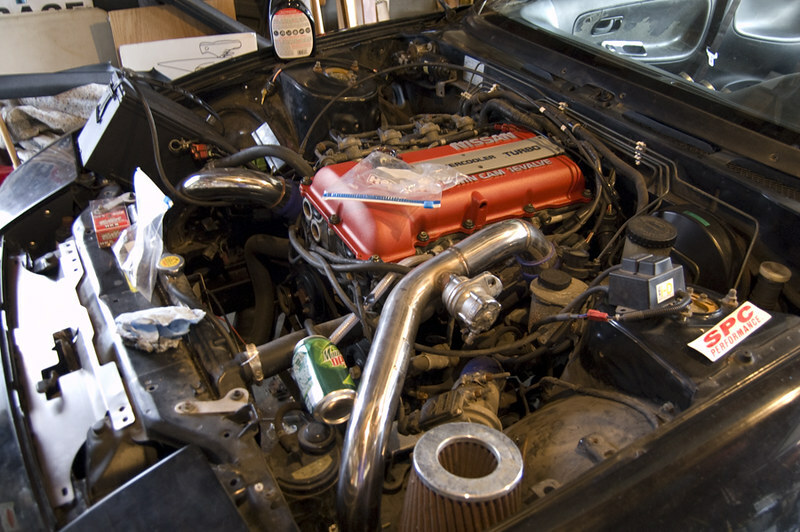 My only additions during this first winter rebuild were a new battery, an Apexi intake, GReddy oil filter relocation, Koyo aluminum radiator with dual electric fans, and a wrinkle red powdercoated valve cover. I added a couple of dress up items to the bay as well including a Circuit Sports coolant overflow, HKS oil and radiator caps, and an ARC cooling panel. The bay was still a total mess and the paint was terrible, but at least it looked a bit more presentable. The exterior of the car wasn’t altered much at this stage in the game. I picked up a Xenon front lip that someone local from Zilvia sold to me and mounted that over the winter. When the weather began to warm up, I spent some time clay baring and waxing the car to attempt to bring some of the shine back. 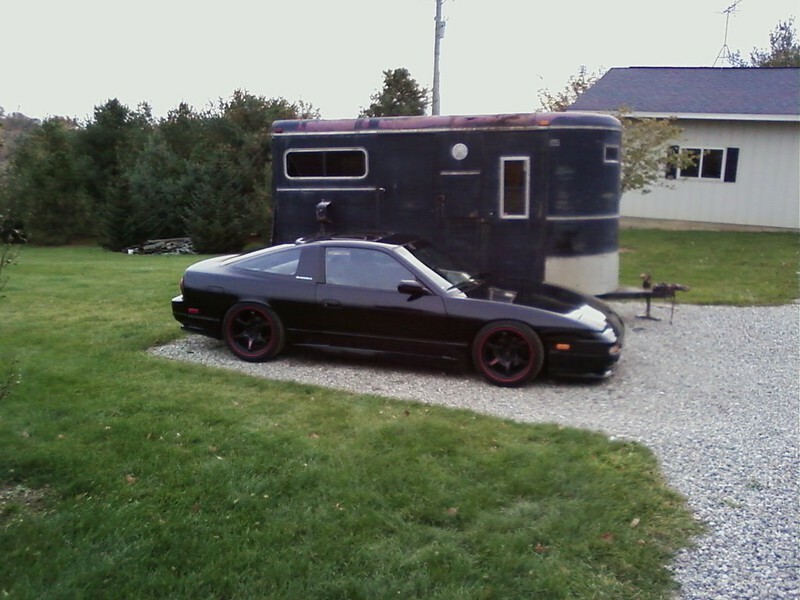 It wasn’t nearly as clean as my Solara, but I was pleased that I was able to bring it back to life a bit. 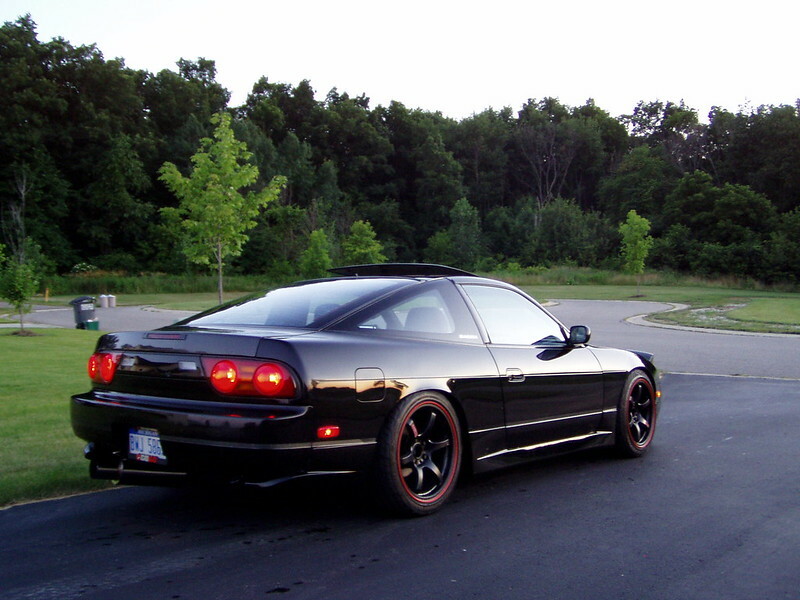 I purchased a set of kouki 180SX tail lights with my tax return to complete the look. For wheels, I went with a set of 17×9 +12 Rays Gram Lights 57 Maximum. I wasn’t totally sold on the finish, but ended up liking them well enough. A friend advised me to run 225/45 tires up front and 245/40 out back if I remember right. By May I was finally able to pull the car out of the garage and drive it for the first time since I had bought it six months earlier. It felt like a completely different car with all of the changes I made. This was by far the most mechanical work I had done to one of my cars before, so I was always nervous about driving it. It was also a lot lower than my previous cars were and the constant scraping of the exhaust always concerned me. After getting an alignment I enjoyed the car for a couple of months but found that I was constantly having issues with it. A bum injector here, a coil pack there, etc. It seemed that the general age of the engine caused issues to pop up left and right. After bottoming out on a large pot hole, my XS Power intercooler bracket broke and I replaced it with a new GReddy unit. I installed a Parts Shop Max skid plate at the same time to protect my oil pan. I continued to modify the exterior of the car by adding chuki side skirts and kouki rear valences. I also drove to Pennsylvania to buy a carbon fiber hood and hatch for the car. After having the aero painted and installing all of these items, I was super happy with the look of the car. When we returned home from our honeymoon in July, I picked up the car from my mom’s house and brought it to our apartment. I found that the turbo was making an odd whistling noise and smoking a bit when I got on the throttle. The exhaust was also beginning to get louder and louder. I took the car back to my grandpa’s garage and found that the turbo had come unbolted from the exhaust manifold, burning up the gasket. I replaced the gasket and slapped the car back together to drive it for the last couple weeks of the season before putting it away for winter storage. 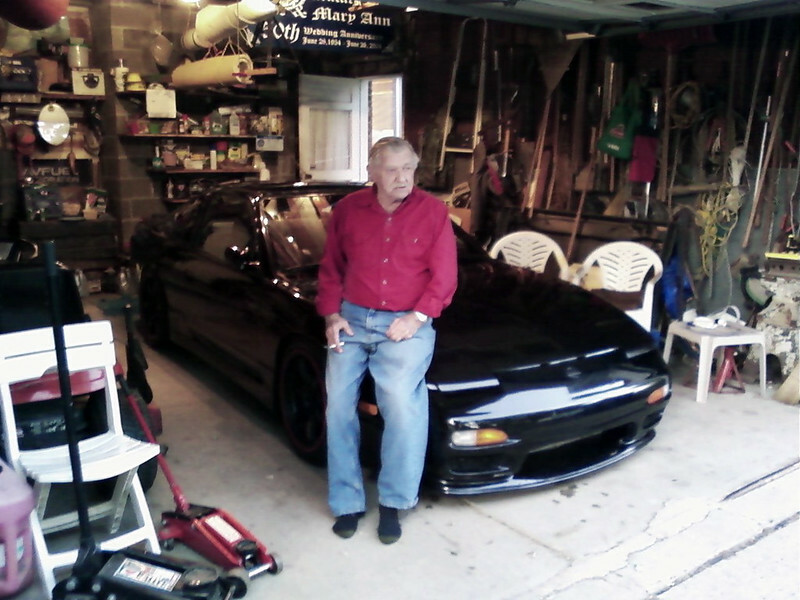 I was proud of the car had I had built in less than a year’s time, but frustrated with how unreliable it was. As the weather began to get nasty once more, I took the car out to my cousin’s house for winter storage. My grandpa had been kind enough to loan me his garage the previous winter but needed space for his vehicles this time around. 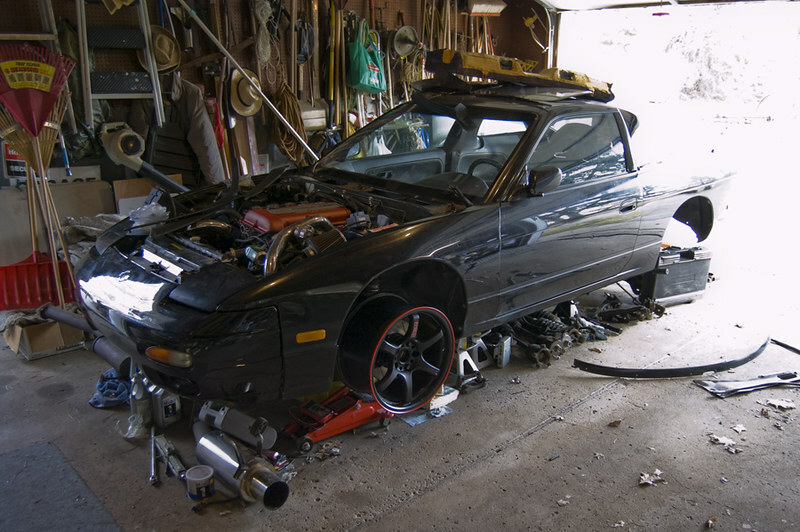 We backed the car into my cousin’s barn and I began to plan out what I would need to do to make the car more reliable for the spring of 2010. Are you beginning to see a theme here? 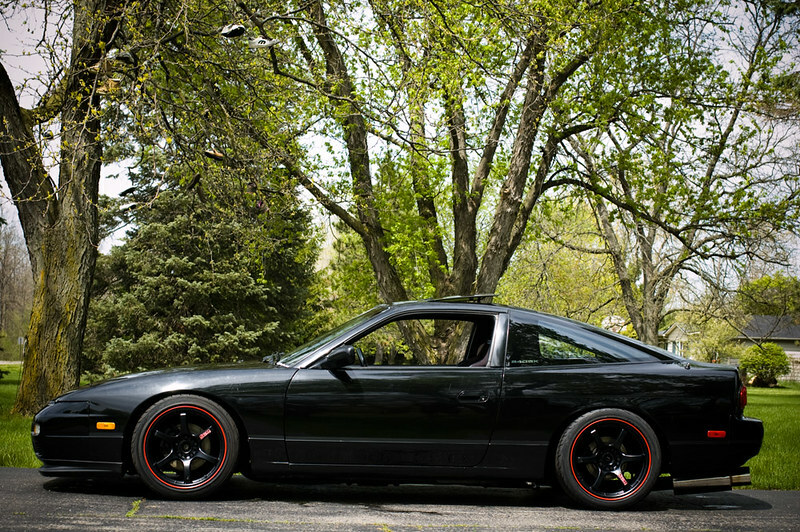 Sometimes with an S13 it’s a matter of trial and error until you get things right. I’m either fortunate or unfortunate enough to live in a part of the world that allows for some down time to work on making your car better and more reliable. Thanks for reading! Next time we’ll dive into the 2010 rebuild where things really begin to come together. Spot on man. These blogs just keep me more and more motivated. Especially you being a stateside neighbor (I live in Indiana) Thanks again for posting this. Thanks for the feedback! It’s motivating for me to look back and look at old photos. Always a good time! Hope things go well for you down there prepping for winter. I can’t believe it’s happening again already! man reading this has made it so much harder to get rid of mine. it’s crazy to know that these cars are as amazing to other people as they are to me. can’t wait for part 3! Thanks! Wait til the part where I get rid of mine… And then get it back, lol. lol let’s hope I don’t pull a “camryonbronze” and get my car back in the future. haha.